As his five year sentence grows close to an end, Gary (Olan Rogers) the lone living inhabitant on a prison ship, encounters an alien creature in space. What Gary doesn’t realise is that Mooncake is not merely the cute alien that he appears to be, but a creature capable of destroying planets pursued by the Lord Commander (Doctor Who‘s David Tennant) due to his ties to the mysterious region known as Final Space. The obvious comparison here is Futurama, and although Final Space does share some DNA with Matt Groening’s iconic sci-fi comedy, it is more than just a clone. The strong story arc linking this season gives the show its own unique style, and allows it to build upon its own mythology amazingly quick. Hence Final Space actual increases in emotional stakes as the show progresses, giving it a surprising amount of depth (in character building and a significant dramatic element) that is perhaps unexpected in a sci-fi cartoon comedy. These stakes are established from the very first sequence as a dying Garry is pictured adrift amongst the wreckage of a colossal space battle, but it takes an episode or two for the audience to catch up with the significance of that scene. As such the first episode is a bit of a hot mess, relying on multiple flashback, and a lot of exposition clunkily delivered. Ultimately this is a hindrance that just has to be borne through, as Final Space soon finds its feet and manages to increase in stature with each subsequent episode. As we become more familiar with the characters, the emotional and comedic pay-off increases, working from a successively stronger and stronger foundation. That solid foundation might be well worn, but it is certainly appealing. 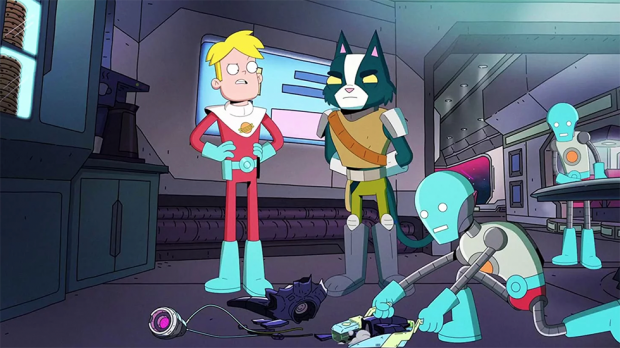 Final Space uses that sci-fi trope of a ragtag crew of misfits bonding and finding strength through their irregularity, that flip-side of the perfect Star Trek crew that is oft repeated in science fiction (Quark, Lexx, Red Dwarf, Futurama, Firefly, Killjoys, Dark Mater… hell… even the USS Callister episode of Black Mirror). It’s a far more empathetic comparison than the overachieving self-actualised ubermensch of Starfleet, and one that we can relate to far easier as an audience. We bond with the crew, and through the series, take a few dramatic punches that are unexpected – hidden by the comedy format of the series. As such, these are more impactful, both due to the unexpected nature, and our empathy for the characters. As such Final Space delivers a lot more than would be expected at first glance. There’s a lot going on beneath the hood for this animated comedy sci-fi show, and something I hope we get to see more of in subsequent seasons.